Accu-Glass Products, Inc. is the leader in Custom Vacuum Cablse assemblies. From custom feedthrough flanges to vacuum custom UHV cable assemblies, Accu-Glass engineers are ready to discuss your complex needs. Call our engineering staff at (818) 365-4215 or send us an email using the contact us form attached to this website. CUSTOM PRODUCTS in 3 easy steps! Provide us with as many detailed requirements for your desired custom vacuum cable/wire as you can. 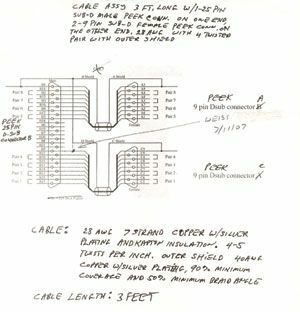 We will work from rough sketches and descriptions to detailed drawings. Our engineering staff will review the requirements of your project and consult with you. We can then provide a quotation within 24 hours in most cases. 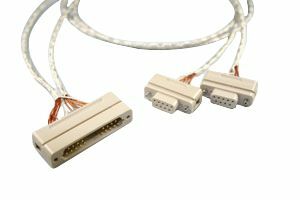 We can provide custom vacuum cable assemblies with Kapton® insulated wire, Teflon® insulated wire and PEEK or Macor vacuum connectors, the options are limitless. Once an order is placed, Accu-Glass Products' engineers will review and approve the requirements. 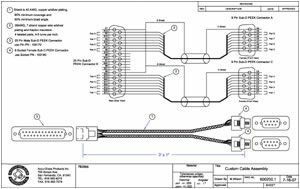 If needed, we'll generate an engineered drawing of your custom vacuum cable/wire assembly including pin-outs and e-mail it to you for approval. Once the approval process has been completed, production will begin at our production facility. Accu-Glass Products can provide small and large quantities as needed with very short lead times. We have been producing Custom Vacuum Cables and Wire for more than 20 years. Need plain Kapton® insulated wire or cable? We have many options to choose from, Click here to view Kapton Vacuum Wire, Teflon insulated vacuum wire.